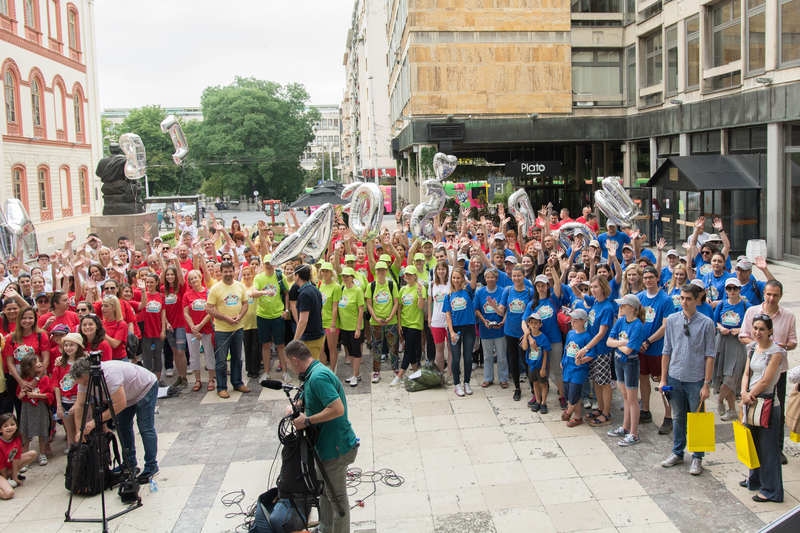 Belgrade, June 9, 2018 – Near 400 volunteers participated in the 10th jubilee edition of the initiative Our Belgrade. At 12 locations in the city, volunteers were redecorating yards of schools and kindergartens, collecting waste, painting rooms and outside walls and participating in workshops. During the opening ceremony of the event at Plateau in front of the Faculty of Philosophy, numerous humanitarian aid boxes for homeless people and members of other vulnerable groups were collected. Volunteers were addressed by Mr. Dejan Turk, Chairman of the Responsible Business Forum, and Neven Marinović, Executive Director of Smart Kolektiv, who said that through Our Belgrade initiative volunteers influenced the quality of life of over 15,000 of their fellow citizens in the past ten years. Employees of the companies Bambi, Banca Intesa, Coca-Cola Hellenic, CRH, Erste Bank, Eurobank, Societe Generale Serbia, UniCredit Bank, Vojvodjanska Bank, Vip mobile and Nordeus participated in this year’s initiative. US Ambassador to Serbia, Mr. Kyle Scott, and the Head of the EU Delegation to Serbia, H.E. Mr. Sam Fabrici, also joined the volunteers. The tenth volunteer initiative Our Belgrade was organized by Smart Kolektiv and Responsible Business Forum, with support of the United States Agency for International Development (USAID) in coalition with the Ana and Vlade Divac Foundation, Trag Foundation, Catalyst Foundation, Serbian Philanthropic Forum and Serbian Chamber of Commerce, and in partnership with Volunteer Service of Stari grad municipality.